A creative date idea doesn’t have to be extravagant to be fun. It’s quite easy to plan a “trip around the world” without leaving your home. 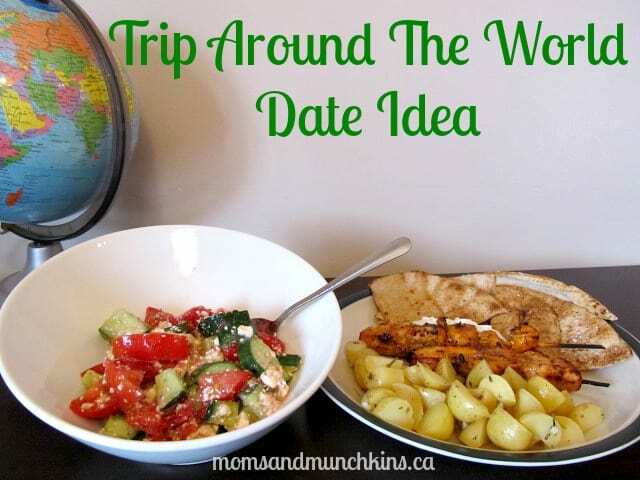 Here are some fun ideas for planning your own trip around the world date night! You don’t necessarily need decorations for your date night, but it does help to set the scene. Your decorations could include flags from other countries, a globe (which could also be used in a fun game) and small figurines representing landmarks around the world. If you love to cook, try out some new recipes from other areas around the world. Each course could be from a different destination. If you aren’t a fan of cooking, no problem! You could pick up a few dishes from your grocery store or order some takeout. Be creative and don’t worry if the pairing of dishes doesn’t make sense – that’s the fun of it! Your appetizers could be Chinese dishes, your salad from Greece, your main dish could be a hearty Italian meal and your dessert could be a delicious Belgian chocolate fondue. Yum! Oh, and don’t forget a traditional drink of some sort. For activity ideas for your trip around the world date think of visiting landmarks around the world, challenging world records and testing your world knowledge. Here are some fun examples! Did you know that the world’s largest LEGO structure was built in South Korea in 2012? It stands 105 feet (31.9) metres high. If you have kids at home, you likely have plenty of LEGO blocks! Try to see how high of a tower you can stack. How many different ways can you say “love”? Using this free printable, give your date 1 minute to try to memorize as many translations of “love” as possible. After 1 minute, take the cheat sheet away and ask him to recite as many as possible. You could award him with one chocolate kiss for each correct answer. Have you ever thought of taking a dance lesson as a couple? How about a dance that is traditional in another country? Visit your local video store to find a dance instructional video. You’re sure to have a few laughs while trying out your new dance moves! Test your world knowledge with this easy to set up game – all you need is a globe! Simply spin the globe, randomly stop it and put your finger on one destination. Your date must name one city in the area. Sounds easy, right?! If you could travel anywhere in the world, where would you go? Visit our Date Night page for even more date ideas with FREE printables! For more romantic ideas plus ideas for family fun, follow along on Facebook, Twitter, and Pinterest with sneak peeks on Instagram. I had a co worker who did this with a group of friends. They would each pick a country out of a hat and once a month they got together for a meal. Each couple brought a side dish relating the country the host picked and the host took care of the main dish, decorated, came up with activities etc around that theme. It seemed like sooo much fun! unfortunately I didn’t have any friends that liked to cook or even ate adventurous food or I would have started one myself! What awesome ideas. We did something very similar and it was great! That is a great idea. You could also choose a wine from which ever country you want to focus on and research trivia before hand to share with one another. What a great idea for a date night!! After 13 years of marriage I love that there are still things we haven’t tried yet! Definitely gonna start planning 🙂 And love the wine idea also Kristen! Wow! This post is so full of fun and adventurous ideas. My hubby and I LOVE date nights when we can find a sitter. 2 years ago we took French classes together, the next year we took a bootcamp class together. This year we are on a committee together and although these are not traditional dates, we pick up coffee on the way to meetings and it is great. Also, movie & natcho nights after the girls are in bed once a week are pretty fun too.